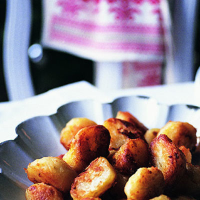 For golden-crusted roast potatoes with fluffy insides, use a floury variety, such as King Edward or Maris Piper. Parboil, then shake the potatoes in the pan to roughen their surface. The roasting tin must be big – if the potatoes are too close together, their steam can’t escape and they will become soggy. And the fat must be really hot; the potatoes should sizzle as they go in. If none of your guests is vegetarian, try using graisse d’oie (goose fat), which adds real depth of flavour. Preheat the oven to 190°C, gas mark 5. Cut the potatoes into large, even-sized pieces and put in a pan of cold water. Bring to the boil and simmer for 10 minutes. Drain well and return to pan. Shake, then heat for 1-2 minutes to dry out. Meanwhile, place the sunflower oil or goose fat in a roasting tin and preheat in the oven for 5 minutes. Carefully spoon the potatoes into the preheated tray of hot fat and turn to coat. Roast for 50-60 minutes or until golden brown, turning halfway through. The potatoes will take longer to roast if the oven door is frequently opened and closed.